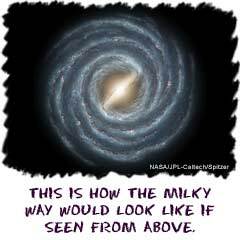 We live in the Milky Way galaxy. Based on our observations, we have a barred-spiral galaxy. While we can estimate the size of our galaxy, it's a little harder to determine its age. We know that the Sun is about 5 billion years old. It's a young star. Based on the observations of other stars in the Galaxy, we think that the Milky Way may be about 12-14 billion years old. The age was estimated by measuring the amount of beryllium (Be) in distant stars. The amount of beryllium increases as a star gets older. Our barred-spiral galaxy is about 100,000 light years across. While the stellar bar in the center of our galaxy had been detected indirectly, recent observations have proved its existence. The bar extends about one-third the diameter of the galaxy. It was once believed that we had a spiral galaxy, but studies in infrared wavelengths by the Spitzer Space Telescope and other newer telescopes have provided evidence about the stellar bar. Our galaxy looks like a spiral form because stars and systems are grouped in constantly moving arms that spin around the center. The Solar System is about half way between the edge of the stellar bar and the edge of the galaxy. We are definitely not alone in our galaxy. There may be as many as 400 billion stars and systems in the Milky Way. Our closest neighbor is Proxima Centauri. It is about 4.2 light years from Earth. Don't forget that our entire galaxy is 100,000 light years across. At this time, the Voyager spacecraft are the only manmade objects to leave the Solar System. Launched in 1977, they should reach the edge of the Solar System by 2015. At this pace, they will need to travel another 82 thousand years before reaching the closest star. As you can tell, we are moving pretty slowly right now and travel to another star is not likely in our lifetime. Millions of galaxies are out there. Ours is impressive because it is ours. The closest galaxy to ours is called the Sagittarius Dwarf. It is a little over 78,000 light years away. If it would take us thousands of years to reach the closest star, you can only imagine how long it would take to reach the closest galaxy. What about life out there? Most scientists believe that there is some form of life on another planet in the universe. With so many galaxies, systems, and planets, chances are good that we can something alive somewhere. Will we find super-smart aliens? Who knows. Most believe that there will be some form of life, maybe microscopic. We're going to start by exploring the planets of our Solar System first. Don't feel down. Even with an entire universe or galaxy to explore, we still have billions of things to discover on Earth and in our Solar System.